Leitrim is the only county in Ireland to have recorded no fatalities on the roads so far this year. The Road Safety Authority have released figures showing the number of deaths on the roads in each county in Ireland from January 1 - June 30, 2018. A multi-agency review by the Transport Minister, gardaí and RSA analyses road fatalities for the first six months of the year by road-user groups, age and location - identifying at-risk groups. Gardaí will update enforcement to date and outline their plans for the rest of 2018, while the RSA forecast road safety statistics up to 2019. There have been 78 fatalities on Irish roads this year up to June 30th. 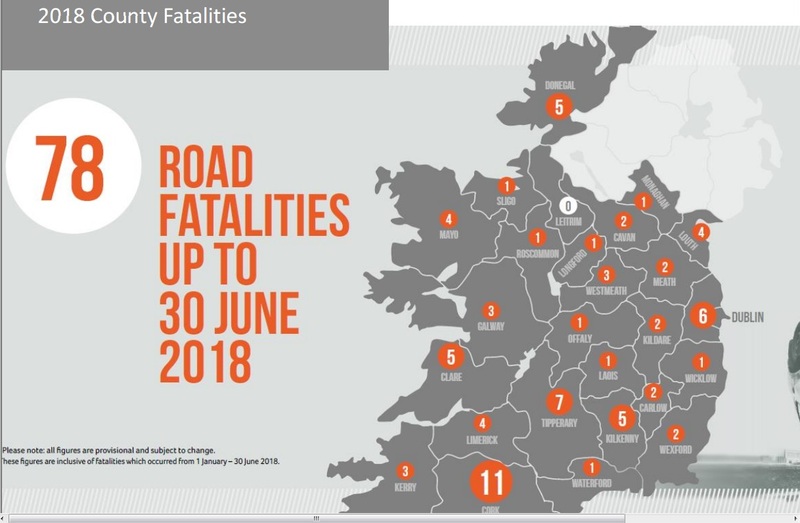 April and June were the worst months so far this year after both saw 17 people killed on Irish roads, while May had the lowest figure with six fatalities on roads in that month. A shocking 50% of fatalities on our roads occurred between Friday and Sunday. The RSA say that if the current trends continue for the rest of the year we could see another 78 people killed on the roads this year.